Another day, another Mortal Kombat 11 leak, only this time, it's not just one or two characters that have somehow sneaked into public view—oh no. This time, we can lay our eyes on the entire 34-strong roster. Clearly, this contains spoils and clearly, this might just be a nifty Photoshop, so if either spoilers or leaks enrage you, you should probably click away now. Originating on Reddit in a post that has—quel surprise—now since been deleted, the image was seen, downloaded, and promptly reuploaded by the entire internet, which means the folks at ResetEra have already pored over the list and analysed who is, and who is not, available. Click the link above for a peek. The image shows several characters we were expecting, such as Sub-Zero, Johnny Cage, Geras, and Baraka, plus a load we haven't seen before like Frost, Erron Black, Jacqui Briggs, Cassie Cage, and Kotal Kahn. Interestingly, the leaked picture seemingly shows character images without any customizations at all, and placeholder shots for Jax, Johnny Cage, Noob Saibot, Kitana, and Shao Khan. The empty black rectangles are, presumably, spaces for DLC characters. At the time of writing, neither NetherRealm Studios nor Warner Bros. have commented publicly to either confirm or deny the leak. Mortal Kombat 11 is out on April 23, 2019. 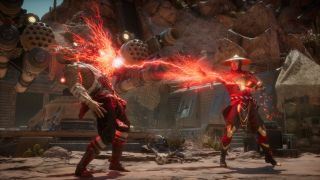 To keep up-to-date on the very latest Mortal Kombat 11 news, bookmark our super handy hub page. Just try and look surprised when NetherRealm formally reveals the character list, okay?